This week I had the pleasure to talk to a customer about NUMA use-cases and a very interesting config came up. They have a VM with a particular memory configuration that exceeds the ESXi host NUMA node memory configuration. This scenario is covered in the vSphere 6.5 Host Resources Deep Dive, excerpt below. The scenario described happens in multi-socket systems that are used to host monster-VMs. 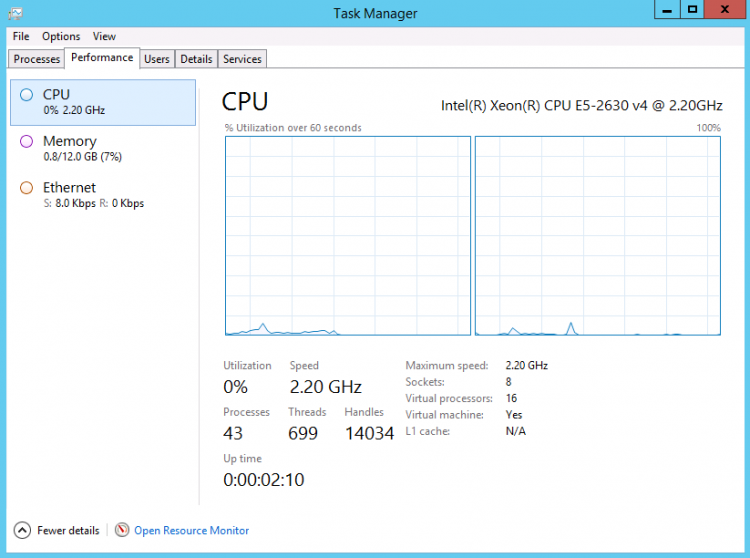 Extreme memory footprint VMs are getting more common by the day. The system is equipped with two CPU packages. 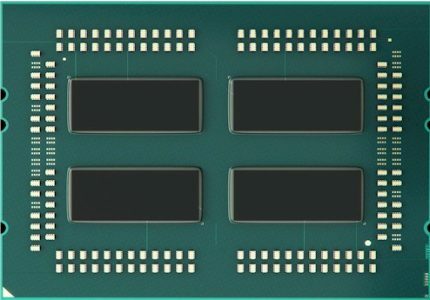 Each CPU package contains twelve cores. The system has a memory configuration of 128 GB in total. 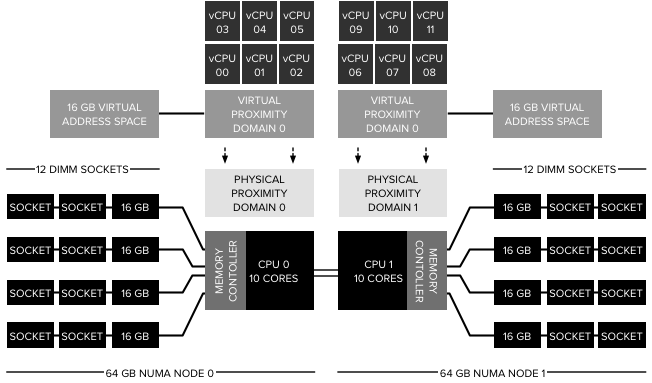 The NUMA nodes are symmetrically configured and contain 64 GB of memory each. However, if the VM requires 96 GB of memory, a maximum of 64 GB can be obtained from a single NUMA node. This means that 32 GB of memory could become remote if the vCPUs of that VM can fit inside one NUMA node. In this case, the VM is configured with 8 vCPUs. The VM fits from a vCPU perspective inside one NUMA node, and therefore the NUMA scheduler configures for this VM a single virtual proximity domain (VPD) and a single a load-balancing group which is internally referred to as a physical proximity domain (PPD). Running a SQL DB on this machine resulted in the following local and remote memory consumption. The VM consumes nearly 64 GB on its local NUMA node (clientID shows the location of the vCPUs) while it consumes 31 GB of remote memory. In this scenario, it could be beneficial to the performance of the VM to rely on the NUMA optimizations that exist in the guest OS and application. The VM advanced setting numa.consolidate = FALSE instructs the NUMA scheduler to distribute the VM configuration across as many NUMA nodes as possible. In this scenario, the NUMA scheduler creates 2 load-balancing domains (PPDs) and allows for a more symmetrical configuration of 4 vCPUs per node. Please note that a single VPD (VPD0) is created and as a result, the guest OS and the application only detect a single NUMA node. Local and remote memory optimizations are (only) applied by the NUMA scheduler in the hypervisor. Whether or not the application can benefit from this configuration depends on its design. If it’s a multi-threaded application, the NUMA scheduler can allocate memory closes to the CPU operation. However, if the VM is running a single-threaded application, you still might end up with a lot of remote memory access, as the physical NUMA node hosting the vCPU is unable to provide the memory demand by itself. Test the behavior of your application before making the change to create a baseline. As always, use advanced settings only if necessary! Some changes are made in ESXi 6.5 with regards to sizing and configuration of the virtual NUMA topology of a VM. A big step forward in improving performance is the decoupling of Cores per Socket setting from the virtual NUMA topology sizing. Understanding elemental behavior is crucial for building a stable, consistent and proper performing infrastructure. If you are using VMs with a non-default Cores per Socket setting and planning to upgrade to ESXi 6.5, please read this article, as you might want to set a Host advanced settings before migrating VMs between ESXi hosts. More details about this setting is located at the end of the article, but let’s start by understanding how the CPU setting Cores per Socket impacts the sizing of the virtual NUMA topology. By default, a vCPU is a virtual CPU package that contains a single core and occupies a single socket. The setting Cores per Socket controls this behavior; by default, this setting is set to 1. Every time you add another vCPU to the VM another virtual CPU package is added, and as follows the socket count increases. The vCPU count exceeds the core count* of the physical NUMA node. * When using the advanced setting “numa.vcpu.preferHT=TRUE”, SMT threads are counted instead of cores to determine scheduling options. The VM is configured with 10 vCPUs (numvcpus). The cupid.coresPerSocket = 1 indicates that it’s configured with one core per socket. The last entry summarizes the virtual NUMA topology of the virtual machine. The constructs virtual nodes and physical domains will be covered later in detail. All 10 virtual sockets are grouped into a single physical domain, which means that the vCPUs will be scheduled in a single physical CPU package that typically is similar to a single NUMA node. To match the physical placement, a single virtual NUMA node is exposed to the virtual machine. 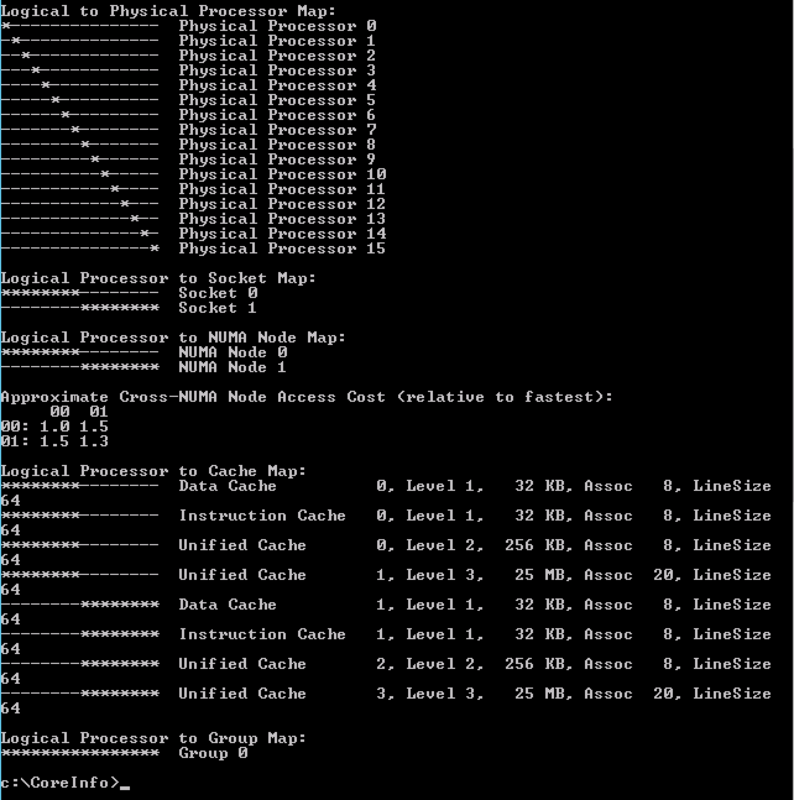 Microsoft Sysinternals tool CoreInfo exposes the CPU architecture in the virtual machine with great detail. (Linux machines contain the command numactl – – hardware and use lstopo -s to determine cache configuration). 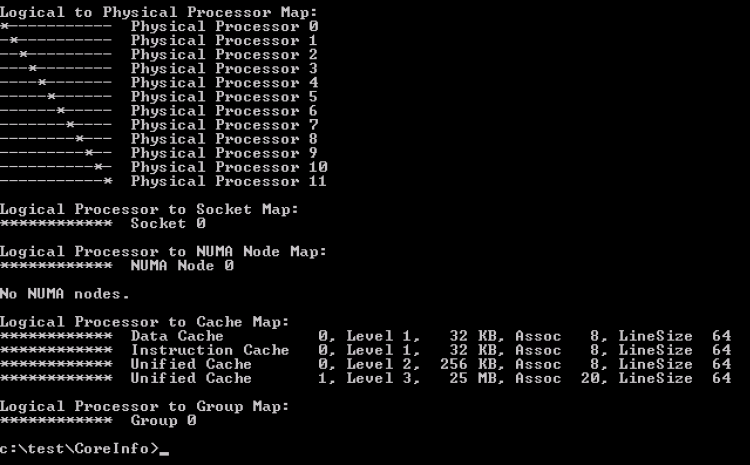 Each socket is listed and with each logical processor a cache map is displayed. Keep the cache map in mind when we start to consolidate multiple vCPUs into sockets. Coreinfo uses an asterisk to represent the mapping of the logical processor to socket map and NUMA Node Map. In this configuration the logical processors in Socket 0 to Socket 7 belong to NUMA Node 0, the CPUs in Socket 8 to Socket 15 belong to NUMA 1. 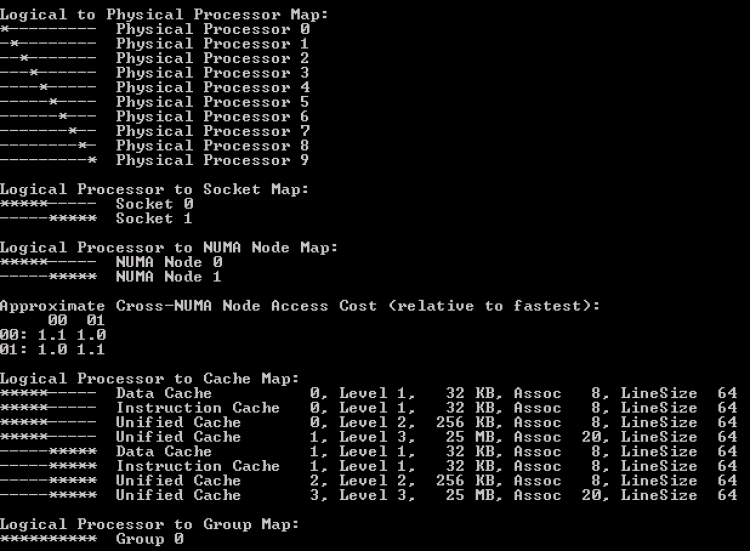 Please note that this screenshot does not contain the entire logical processor cache map overview. In the previous example in which the VM was configured with 10 vCPUs, the numa.autosize.vcpu.maxPerVirtualNode = “10”, in this scenario, the 16 vCPU VM, has a numa.autosize.vcpu.maxPerVirtualNode = “8”. 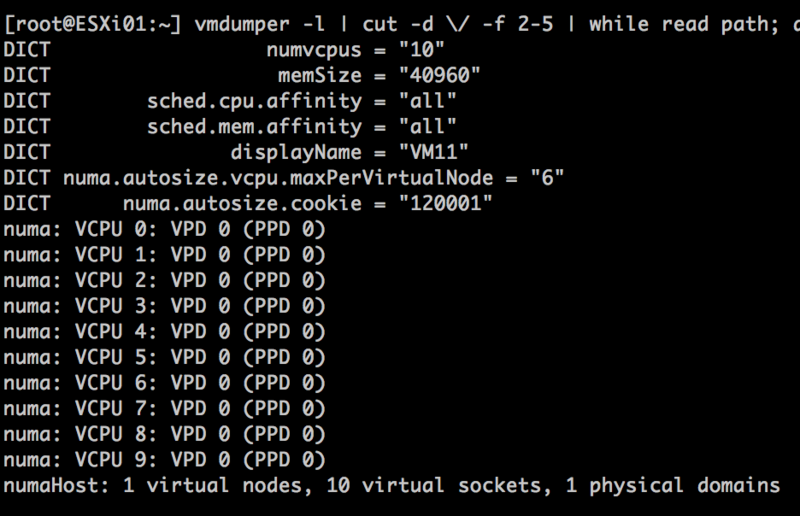 The VMkernel symmetrically distributes the 16 vCPUs across multiple virtual NUMA Nodes. 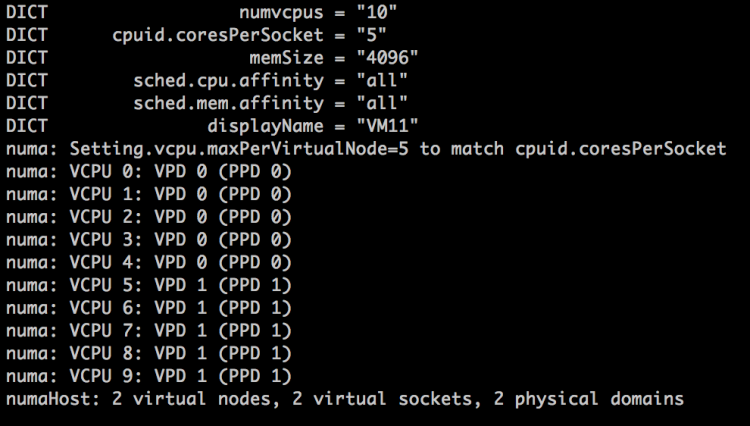 It attempts to fit as much vCPUs into the minimum number of virtual NUMA nodes, hence the distribution of 8 vCPU per virtual node. It actually states this “Exposing multicore topology with cpuid.coresPerSocket = 8 is suggested for best performance”. A virtual NUMA topology consists of two elements, the Virtual Proximity Domains (VPD) and the Physical Proximity Domains (PPD). The VPD is the construct what is exposed to the virtual machine, the PPD is the construct used by NUMA for placement (Initial placement and load-balancing). The PPD auto sizes to the optimal number of vCPUs per physical CPU Package based on the core count of the CPU package. Unless the setting Cores per Socket within a VM configuration is used. In ESXi 6.0 the configuration of Cores per Socket dictates the size of the PPD, up to the point where the vCPU count is equal to the number of cores in the physical CPU package. In other words, a PPD can never span multiple physical CPU packages. The best way to perceive a proximity domain is to compare it to a VM to host affinity group, but in this context, it is there to group vCPU to CPU Package resources. The PPD acts like an affinity of a group of vCPUs to all the CPUs of a CPU package. A proximity group is not a construct that is scheduled by itself. It does not determine whether a vCPU gets scheduled on a physical resource. It just makes sure that this particular group of vCPUs consumes the available resources on that particular CPU package. A VPD is the construct that exposes the virtual NUMA topology to the virtual machine. The number of VPDs depends on the number of vCPUs and the physical core count or the use of Cores per Socket setting. By default, the VPD aligns with the PPD. If a VM is created with 16 vCPUs on the test server two PPD’s are created. These PPD allow the VPDs and its vCPUs to map and consume physical 8 cores of the CPU package. If the default vCPU settings are used, each vCPU is placed in its own CPU socket (Cores per Socket = 1). In the diagram, the dark blue boxes on top of the VPD represent the virtual sockets, while the light blue boxes represent vCPUs. The VPD to PPD alignment can be overruled if a non-default Cores per Socket setting is used. A VPD spans multiple PPDs if the number of the vCPUs and the Cores per Socket configuration exceeds the physical core count of a CPU package. For example, a virtual machine with 40 vCPUs and 20 Cores per Socket configuration on a host with four CPU packages containing each 10 cores, creates a topology of 2 VPD’s that each contains 20 vCPUs, but spans 4 PPDs. The Cores per Socket configuration overwrites the default VPD configuration and this can lead to suboptimal configurations if the physical layout is not taken into account correctly. Specifically, spanning VPDs across PPDs is something that should be avoided at all times. This configuration can render most CPU optimizations inside the guest OS and application completely useless. For example, OS and applications potentially encounter remote memory access latencies while expecting local memory latencies after optimizing thread placements. It’s recommended to configure the VMs Cores per Socket to align with the physical boundaries of the CPU package. In ESXi 6.5 the CPU scheduler has got some interesting changes. Expect an interesting blog post of Mark Achtemichuk (VMware performance team) soon. One of the changes in ESXi 6.5 is the decoupling of Cores per Socket configuration and VPD creation to further optimize virtual NUMA topology. Up to ESXi 6.0, if a virtual machine is created with 16 CPUs and 2 Cores per Socket, 8 PPDs are created and 8 VPDs are exposed to the virtual machine. The problem with this configuration is that it the virtual NUMA topology does not represent the physical NUMA topology correctly. To avoid “fragmentation” of local memory, the behavior of VPDs and it’s relation to the Cores per Socket setting has changed. In ESXi 6.5 the size of the VPD is dependent on the number of cores in the CPU package. This results in a virtual NUMA topology of VPDs and PPDs that attempt to resemble the physical NUMA topology as much as possible. As a result of having only two physical NUMA nodes, only two PPDs and VPDs are created. Please note that the Cores per Socket setting has not changed, thus multiple sockets are created in a single VPD. A new line appears in ESXi 6.5; “NUMA config: consolidation =1”, indicating that the vCPUs will be consolidated into the least amount of proximity domains as possible. 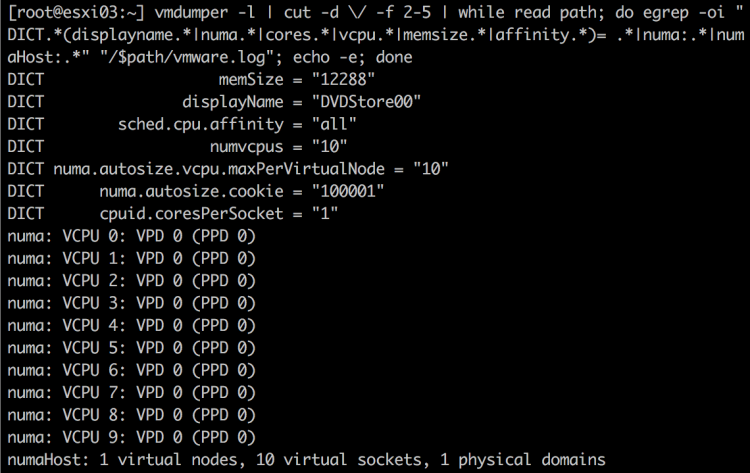 In this example, the 16 vCPUs can be distributed across 2 NUMA nodes, thus 2 PPDs and VPDs are created. Each VPD exposes a single memory address space that correlates with the characteristics of the physical machine. With this new optimization, the virtual NUMA topology corresponds more to the actual physical NUMA topology, allowing the operating system to correctly optimize its processes for correct local and remote memory access. Modern applications and operating systems manage memory access based on NUMA nodes (memory access latency) and cache structures (sharing of data). Unfortunately most applications, even the ones that are highly optimized for SMP, do not balance the workload perfectly across NUMA nodes. Modern operating systems apply a first-touch-allocation policy, which means that when an application requests memory, the virtual address is not mapped to any physical memory. When the application accesses the memory, the OS typically attempts to allocate it on the local or specified NUMA if possible. In an ideal world, the thread that accessed or created the memory first is the thread that processes it. Unfortunately, many applications use single threads to create something, but multiple threads distributed across multiple sockets access the data intensively in the future. Please take this into account when configuring the virtual machine and especially when configuring Cores per Socket. The new optimization will help to overcome some of these inefficiencies created in the operating system. However, sometimes it’s required to configure the virtual machine with a deviating Cores per Socket setting, due to licensing constraints for example. If you are required to set Cores per Socket and you want to optimize guest operating system memory behavior any further, then configure the Cores per Socket to align with the physical characteristics of the CPU package. As demonstrated the new virtual NUMA topology optimizes the memory address space, providing a bigger more uniform memory slice that aligns better with the physical characteristics of the system. One element has not been thoroughly addressed and that is cache address space created by a virtual socket. As presented by CoreInfo, each virtual socket advertises its own L3 cache. In the scenario of the 16 vCPU VM on the test system, configuring it with 8 Cores per socket, this configuration resembles both the memory and the cache address space of the physical CPU package the most. Coreinfo shows the 16 vCPUs distributed symmetrically across two NUMA nodes and two sockets. 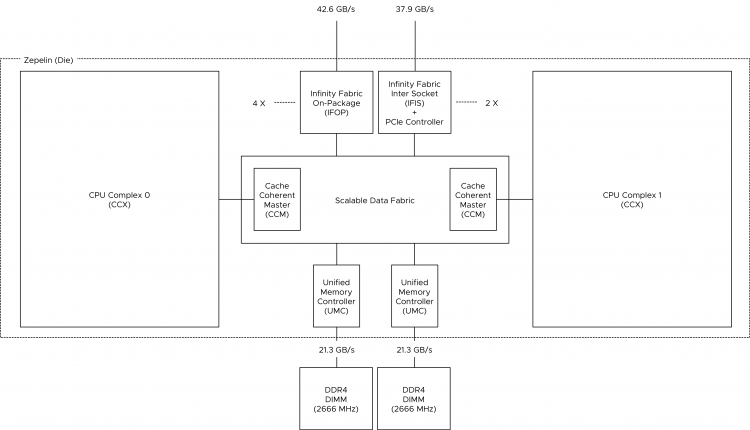 Each socket contains 8 CPUs that share L3 cache, similar to the physical world. Unfortunately, there are some virtual NUMA topology configurations that cannot be consolidated properly by the GA release of ESXi 6.5 when vMotioning a VM from an older ESXi version. A reboot of the host is not necessary! This setting makes ESXi 6.5 behave as ESXi 6.0 when creating the virtual NUMA topology. That means that the Cores per Socket setting determines the VPD sizing. There have been some cases reported where the ESXi 6.5 crashes (PSOD). Test it in your lab and if your VM configuration triggers the error set the FollowCoresPerSocket setting as an advanced configuration. Knowledge base article 2147958 has more information. I’ve been told that the CPU team is working on a permanent fix, I do not have insights when this fix will be released! ESXi Server is optimized for NUMA systems and contains a NUMA scheduler and a CPU scheduler. When ESXi runs on a NUMA platform, the VMkernel activates the NUMA scheduler. The primary role of the NUMA scheduler is to optimize the CPU and memory allocation of virtual machines by managing the initial placement and load balance virtual machine workloads dynamically across the NUMA nodes. Allocation of physical CPU resources to virtual machines is carried out by the CPU scheduler. It is crucial to understand that the NUMA scheduler is responsible for the placement of the virtual machine, but it’s the CPU scheduler that is ultimately responsible for allocating physical CPU resources and scheduling of vCPUs of the virtual machine. The main reason to emphasize this is to understand how hyper-threading fits into CPU and NUMA scheduling. Before diving into the specifics of NUMA optimizations, let’s calibrate the understanding of the various components used at the physical layer, the ESXi kernel layer, and the virtual machine layer. A host consist of a CPU Package, that is the physical CPU piece with the pins, this is inserted in a socket (pSocket). Together with the local memory, they form a NUMA node. Within the CPU package, cores exist. In this example, the CPU package contains four cores and each core has hyper-threading (HT) enabled. All cores (and thus HT) share the same cache architecture. At the ESXi layer, the PCPU exist. A PCPU is an abstraction layer inside the ESXi kernel and can consume a full core or it can leverage HT. At the VM layer, a virtual socket, and a vCPU exists. A virtual socket can map to a single PCPU or span multiple PCPUs. This depends on the number of vCPUs and the settings cores per socket inside the UI (cpuid.CoresPerSocket). The vCPU is the logical representation of the PCPU inside the virtual machine. The configuration vCPU and cores per socket impact the ability of applications (and operating systems) to optimize for cache usage. In order to apply initial placement and load balancing operations, the NUMA scheduler creates two logical constructs, the NUMA home node (NHN) and the NUMA client. The NUMA home node is a logical representation of a physical CPU package and its local memory. In this example, the NUMA home node consists of 4 cores and its local memory. 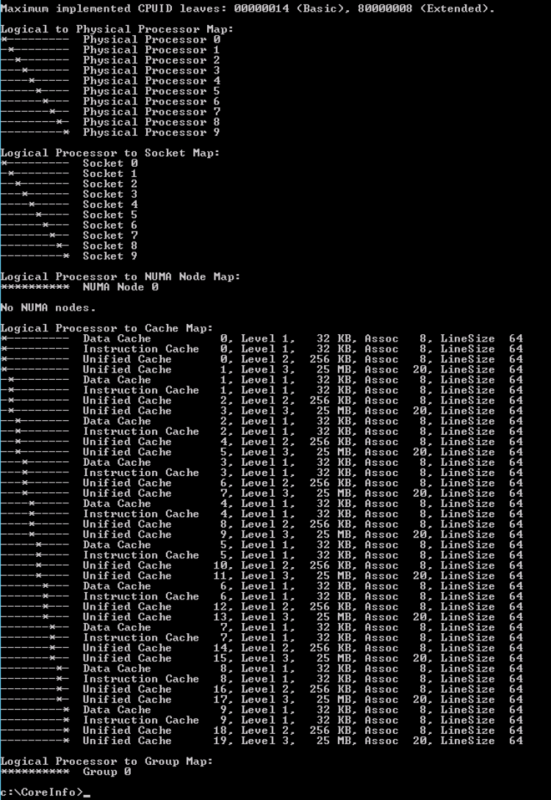 By default the NUMA Home Node allows the NUMA client to count the physical cores in the CPU package. This count impacts the default NUMA client size. This NUMA home node size is important to understand for virtual machine sizing. If the number of VCPUs of a VM exceeds the physical core count of one CPU package it is distributed across multiple nodes. If necessary, due to workload characteristics, distribution can be avoided by reducing the number of the vCPUs, or have the NUMA scheduler consider HTs. By default NUMA optimization does not count the HTs when determining if the virtual machine could fit inside the NUMA home node. For particular workload that benefits from sharing cache and memory, it might be preferable to have the NUMA scheduler count the available HTs during the power-on operation. This setting, preferHT, is expanded upon in a paragraph below. Similar consideration should be applied when sizing memory for the virtual machine. If the virtual memory configuration exceeds the NUMA home node configuration, then the memory scheduler is forced to consume memory from that is attached to another NUMA node. Please note that the NUMA scheduler is focused on consuming as much local memory as possible, it tries to avoid consuming remote memory. Typically a CPU Package and its local memory are synonymous with a NUMA home node, exceptions are Intel Cluster-on-Die technology and AMD Opteron (Magny Cours and newer). When Cluster-on-Die is enabled on an Intel Xeon CPU, the CPU package is split up into two NUMA nodes optimizing the local cache structures. If Cluster-on-Die is enabled on a dual Intel Xeon system , there are two CPU packages but four NUMA nodes. Marc Lang (@marcandreaslang) demonstrated COD on a 512GB system. Before COD, the system created two NUMA nodes, each addressing 256 GB per NUMA node. 3rd line from above NUMA/MB, two nodes are listed both containing ~262000 MB. After enabling COD the system created four NUMA nodes, each addressing 128 GB per NUMA node. Traditionally, the NUMA home node is the boundary for Transparent Page Sharing (TPS). 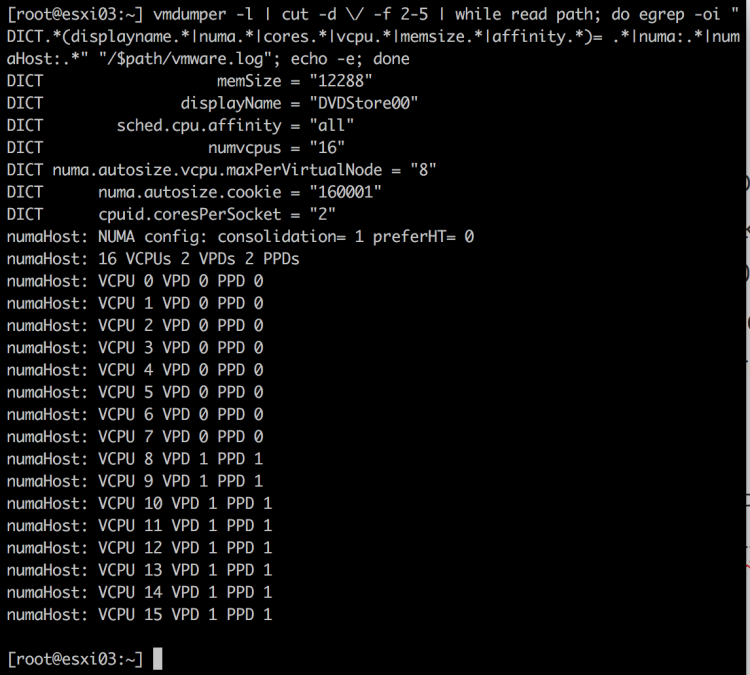 That means that only memory is shared between VMs within a NUMA node and not across NUMA nodes. However, due to multiple modifications to memory management, benefits of TPS during normal operations have been reduced increasingly. First, large pages sharing index small pages inside the large page, but won’t allow to share and collapse until memory pressure occurs. (Duncan wrote an must read in-depth article about the thresholds of breaking large pages in 6.0) With the introduction of a security patch, described in KB 2080735, salting was introduced. I described salting in detail here, but in short, salting restricts TPS to share only memory within the VM itself. Inter-VM TPS is no longer enabled by default. Please remember that salting did not increase the memory footprint directly, it just impacts savings when memory pressure occurs and large pages are collapsed. Instead of mapping many VMs to the same memory page, each VM will still have its own memory page. Although it makes sense to consider TPS, to reduce memory footprint and get more cache hits by referring to memory that is already local, but the overall benefit of large pages is overwhelming due to fewer TLB misses and faster page table look-up time. Up to 30% performance improvements are claimed by VMware. If you want to use TPS as much as possible during memory pressure, please follow the instructions listed in KB 2080735. Verify is you operating system is using ASLR (Address Space Layout Randomization) for security purposes or SuperFetch (proactive caching), if you run a Windows VDI environment, as both technologies can prevents sharing of memory pages. A NUMA client is the collection of vCPU and memory configuration of a virtual machine. The NUMA client is the atomic unit of the NUMA scheduler that is subject to initial placement and load balancing operations. By default, the maximum number of vCPUs grouped with a NUMA client cannot exceed the physical core count of a CPU package. During power-on operations, the number of vCPUs are counted and are compared to the number of physical cores available inside the CPU Package. If the vCPU count does not exceed the physical core count a single NUMA client is created. These VCPUs will consume PCPUs from a single CPU package. If the number of vCPUs exceeds the number of physical cores inside a single CPU package, multiple NUMA clients are created. For example, if a VM is configured with 12 vCPUs and the CPU package contains 10 cores, two NUMA clients are created for that virtual machine and the vCPUs are equally distributed across the two NUMA clients. Please note that there is no affinity set between a PCPU and a NUMA client. The CPU scheduler can migrate vCPUs between any PCPU provided by the CPU package! This allows the CPU scheduler to balance the workload optimally. If multiple NUMA clients are created for a single virtual machine, then this configuration is considered to be a Wide-VM. The NUMA scheduler provides an extra optimization called vNUMA. vNUMA exposes the NUMA structure of the virtual machine, not the entire NUMA topology of the host, to the Guest OS running in the virtual machine. 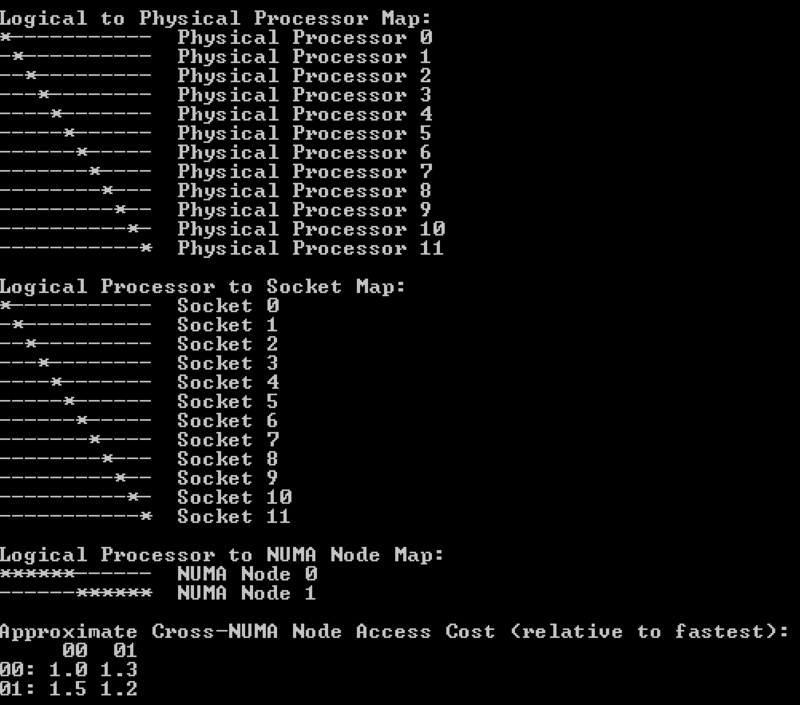 This means in the case of the 12 vCPU VM, vNUMA exposes two NUMA nodes with each 6 CPUs to the guest operating system. This allows the operating system itself to apply NUMA optimizations. Now that the basics are covered, let’s dive into the NUMA client construct a little deeper and determine why proper sizing and sockets per core count can be beneficial to virtual machine performance. During power-on, the NUMA scheduler creates a NUMA client, the internal name for a NUMA client is a Physical Proximity Domain (PPD). 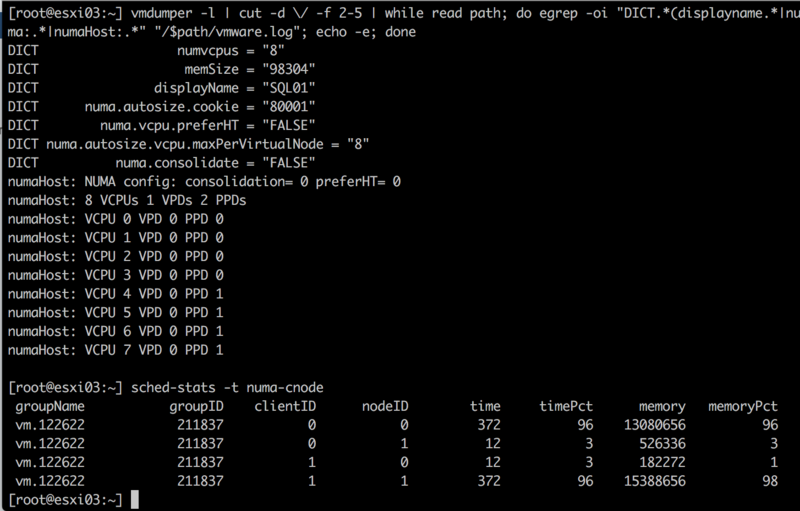 The vCPUs grouped into a single NUMA client are placed in its entirety on a NUMA node. During load-balancing operations, the group of vCPUs is migrated together. vCPUs remain inside a NUMA client and cannot be migrated between NUMA nodes or NUMA clients individually. Memory load balancing operations is determined by reviewing the NUMA client configuration and the current overall activity within the system. The NUMA scheduler has different load-balancing types to solve imbalance or improve performance. For example, if a virtual machine has local and remote memory, NUMA determines whether it makes sense to migrate the group of vCPUs or to migrate the memory to the NUMA home node if possible. Initial placement and load balancing operations are covered in more detail in the next article of this series. A Virtual Proximity Domain (VPD) is presented to the guest as the NUMA node. The size of the VPD is determined by the number of vCPUs and the cpuid.CoresPerSocket configuration or the number of vCPUs and the preferHT setting (PCPU count / Logical CPU count). By default, the VPD aligns with the PPD, unless the vCPU count exceeds the physical core count and cpuid.CoresPerSocket is more than 1. For example, a virtual machine with 40 vCPUs and cpuid.CoresPerSocket of 20, creates a topology of 2 VPD’s containing 20 vCPUs spanning 4 PPDs containing each 10 PCPUs. Spanning VPDs across PPDs is something that should be avoided at all times. This configuration can create cache pollution and render most CPU optimizations inside the guest OS and application completely useless. It’s recommended to configure the VMs Cores Per Socket to align with the physical boundaries of the CPU package. This forces the NUMA scheduler to reconfigure the NUMA clients on every power-cycle. Be aware that some workloads that can be negatively impacted when NUMA topology changes. Be careful using this setting. Courtesy of Valentin Bondzio of VMware. The output shows that the virtual machine is backed by two Physical Proximity Domain (PPD0 and PPD1) and that two Virtual Proximity Domain exists (VPD0 and VPD1). Both VPDs are backed by a single PPD. The vCPUs are equally distributed across the proximity domains, vCPU0 – vCPU5 are running on PPD0, vCP6-vCPU11 are running on PPD1. ESXTOP shows that the VM is running on two NUMA home nodes (ESXTOP, press M for memory, F to adjust fields, G to enable NUMA stats, SHIFT-V to display VMs only). NHM stands for NUMA home node and in this case, the VM has two NUMA home nodes, NHN0 and NHN1. But what if the virtual machine contains 10 vCPUs instead of 12? 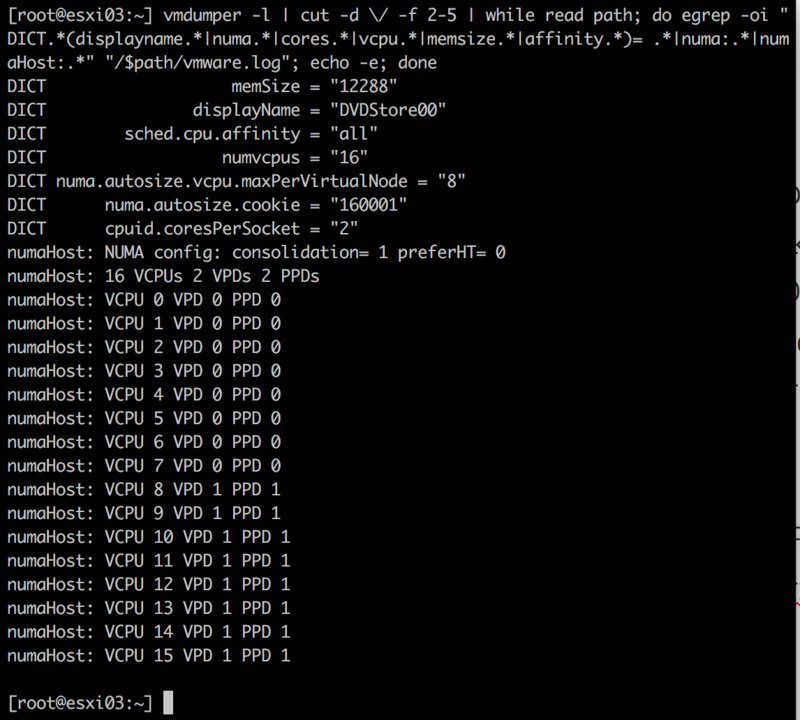 The VM is backed by a single vNUMA client (VPD0) running on a single NUMA home node, NHN0. Although there is one vNUMA node present, it is not exposed to Windows. Thus windows only detect 10 CPUS. Any reference to NUMA is lacking inside the CPU performance monitor. The advanced parameter numa.vcpu.preferHT=TRUE is an interesting one as it is the source of confusion whether a NUMA system utilizes HT or not. In essence, it impacts the sizing of the NUMA client and therefore subsequent scheduling and load balancing behavior. By default the NUMA scheduler places the virtual machines into as few NUMA nodes as possible, trying spread the workload over the fewest cache structures it can. During placement, it only considers full physical cores for scheduling opportunity, as it wants to live up to the true potential of the core performance. Therefore, the NUMA client size is limited to the number of physical cores per CPU package. Some applications share lots of memory between its threads (cache intensive footprint) and would benefit from having as much as memory local as possible. And usually benefitting from using a single local cache structure as well. For these workloads, it could make sense to prefer using HTs with local memory, instead of spreading the vCPUs across full cores of multiple NUMA home nodes. The preferHT setting allows the NUMA scheduler to create a NUMA client that goes beyond the physical core count, by counting the present threads. 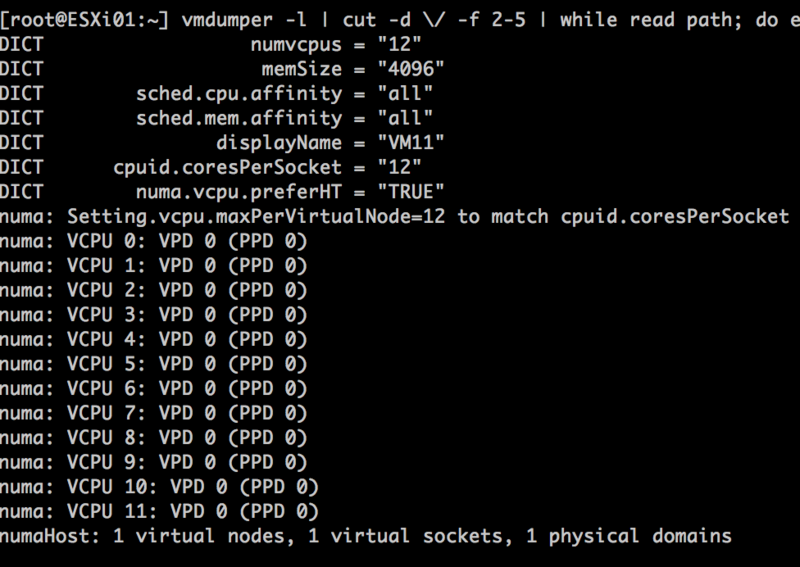 For example, when running a 12 vCPU virtual machine on a 10 core system, the vCPUs are distributed equally across two NUMA clients (6-6)C. When using numa.vcpu.preferHT=TRUE the NUMA scheduler counts 20 scheduling possibilities and thus a single VPD is created of 12, which allows the NUMA scheduler to place all the vCPU’s into a single CPU package. Please note that this setting does not force the CPU scheduler to only run vCPUs on HTs. It can still (and possible attempt to) schedule a vCPU on a full physical core. The scheduling decisions are up to the CPU scheduler discretion and typically depends on the over-commitment ratio and utilization of the system. For more information about this behavior please review the article Reservations and CPU scheduling. Because logical processors share resources within a physical core, it results in lower CPU progression than running a vCPU on a dedicated physical core. Therefore, it is imperative to understand whether your application has a cache intensive footprint or whether it relies more on CPU cycles. When using the numa.vcpu.preferHT=TRUE setting, it instructs the CPU scheduler to prioritize on memory access over CPU resources. As always, test thoroughly and make a data-driven decision before moving away from the default! I’m maybe overstating the obvious, but in this scenario, make absolutely sure that the memory sizing of the VM fits within a NUMA home node. 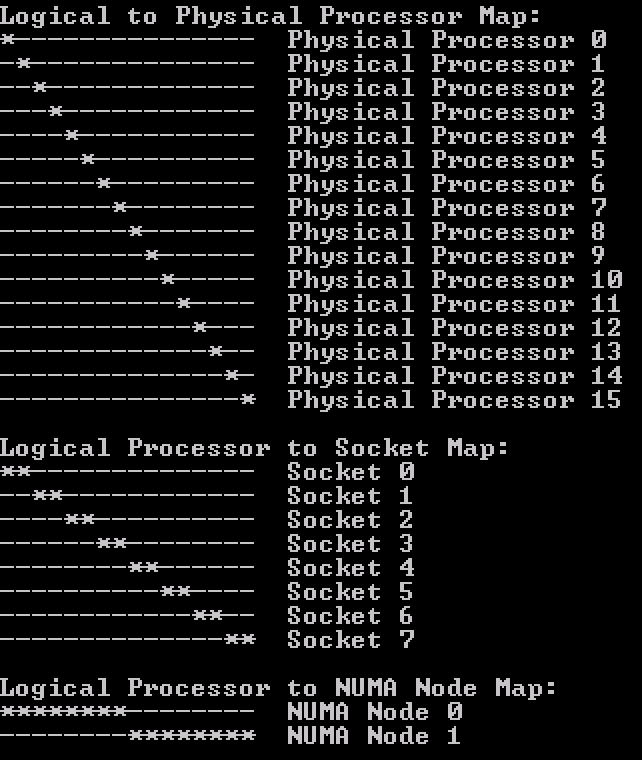 The NUMA scheduler attempts to keep the memory local, but if the amount of memory does not fit a single NUMA node it has to place it in a remote node, reducing the optimization of preferHT. numa.vcpu.preferHT=TRUE is a per-vm setting, if necessary this setting can be applied at host level. KB article 2003582 contains the instructions to apply the setting at VM and host level. Keep in mind that when you set preferHT on a virtual machine that has already been powered-on once the NUMA client auto size is still active. Adjust the auto size setting in the advanced configuration of the virtual machine or adjust the Cores Per Socket. More about this combination of settings are covered in a paragraph below. Sometimes it’s necessary to reduce the NUMA client size for application memory bandwidth requirements or for smaller systems. These advanced parameters can help you change the default behavior. As always make a data-driven-decision before you apply advanced parameters in your environment. 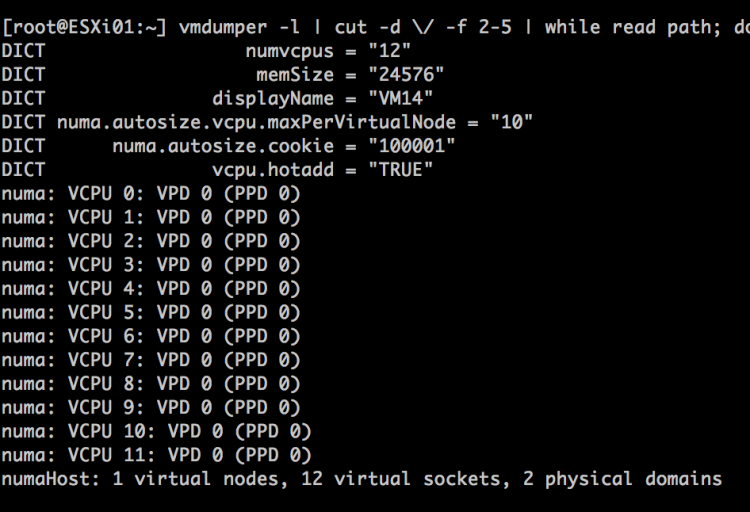 Interesting to note is the size of 10 vCPUs in relationship to the vNUMA setting. One of the most documented settings is the advanced setting numa.vcpu.min. 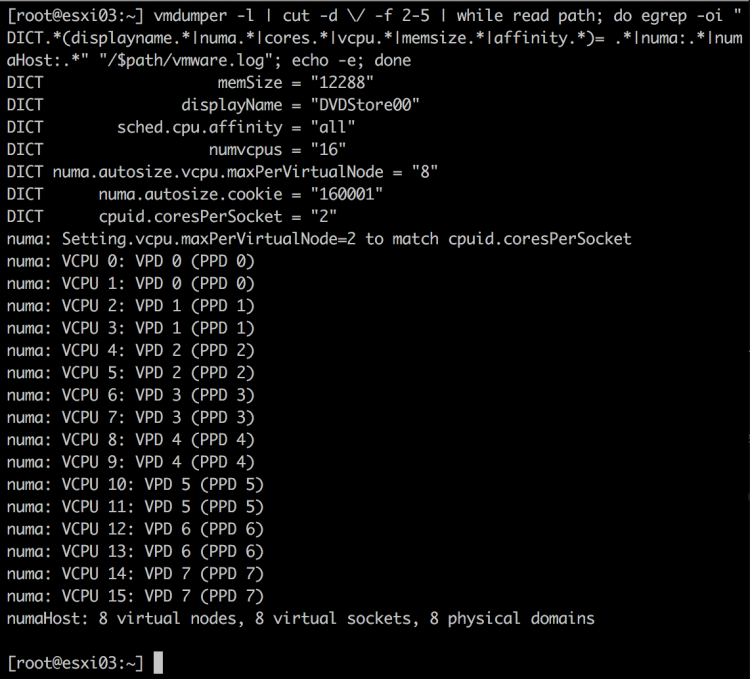 Many sites and articles will tell you that vNUMA is enabled by default on VMs with 8 vCPUs or more. This is not entirely true. vNUMA is enabled by default once the vCPU count is 9 or more AND the vCPU count exceeds the number of physical core count. 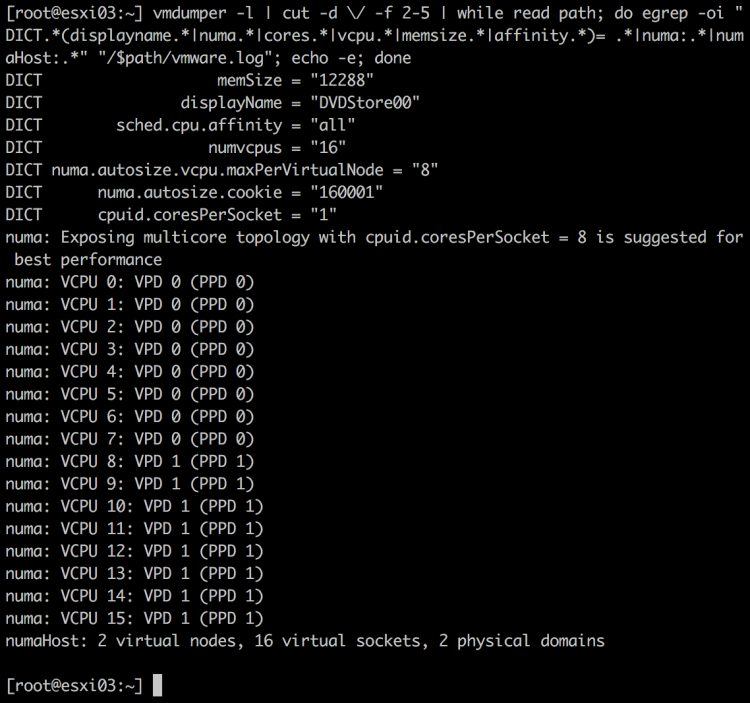 You can use the numa.vcpu.min setting when your NUMA nodes and VM vCPU configurations are smaller than 8 and you want to expose vNUMA topology to the guest OS. Some workloads are bandwidth intensive rather than memory latency sensitive. In this scenario, you want to achieve the opposite of what numa.vcpu.preferHT achieves and use the setting numa.vcpu.maxPerMachineNode. This setting allows you to reduce the number of vCPU that is grouped within a NUMA client. It forces the NUMA scheduler to create multiple NUMA clients for a virtual machine which would have fit inside a single NUMA home node if the default settings were used. The UI setting Cores per Socket (Advanced parameter: cpuid.coresPerSocket) directly creates a vNUMA node if a value is used that is higher than 1 (and the number of total vCPUs exceeds the numa.vcpu.min count). Using the 10 vCPU VM example again, when selecting 5 Cores per Socket, the ESXi kernel exposes two vSockets and groups 5 virtual CPUs per vSocket. When reviewing the VPD and PPD info, the VMware.log shows two virtual nodes are created, running on 2 virtual sockets deployed on 2 physical domains. If you change cpuid.coresPerSocket you also change numa.vcpu.maxPerVirtualNode and the log files confirms this: Setting.vcpu.maxPerVirtualNode=5 to match cpuid.coresPerSocket. 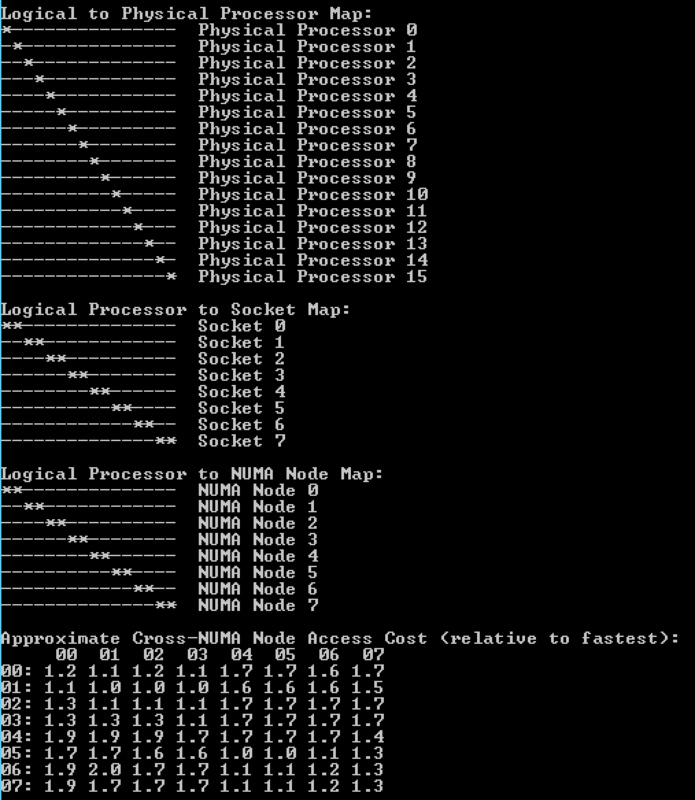 Now compare the previous output with the Coreinfo output of a virtual machine that has 10 cores split across 2 NUMA nodes but using the default setting cores per socket = 1. 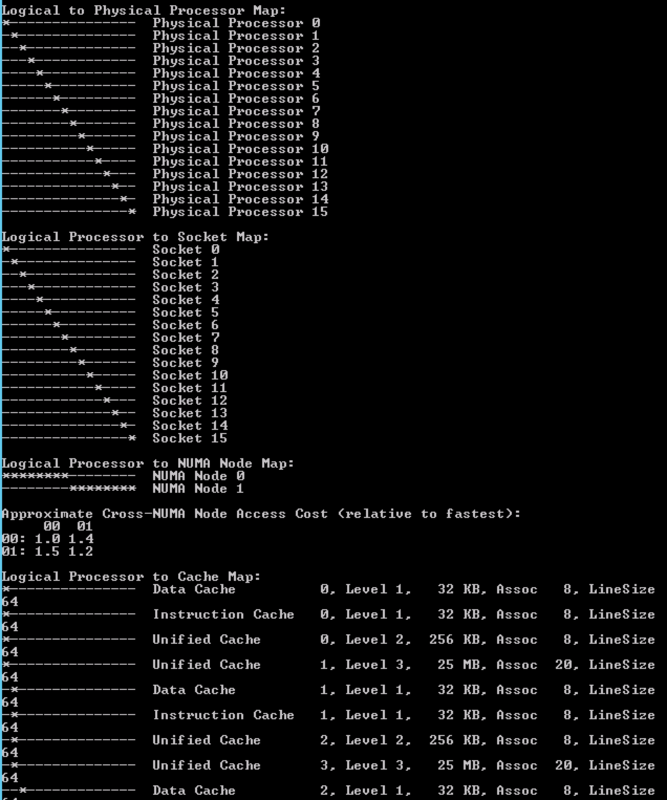 It’s the “Logical Processor to Cache Map” that is interesting! This shows that the virtual socket topology is exposed to the guest operating system, along with its cache topology. Many applications that are designed to leverage multi-CPU systems, run optimizations to leverage the shared caching.Therefore it makes sense that when the option preferHT is used, to retain the vCPUs in a single socket, the Cores Per Socket reflect the physical cache topology. Verify with the vmdumper command that numa.vcpu.preferHT is accepted and that the guest OS will see 1 NUMA node with all vCPUs grouped on a single socket. Please note that applications and operating systems can now apply their cache optimizations as they have determined all CPUs share the same last level cache. However, not all applications are this advanced. Contact your software vendor to learn if your application can benefit from such a configuration. If CPU Hot Add is enabled, NUMA client cannot be sized deterministically. Remember that NUMA client sizing only happens during power-on operations and the Hot Add option is the complete opposite by avoiding any power operation. Due to this, NUMA optimizations are disabled and memory is interleaved between the NUMA Home Nodes for the virtual machine. This typically results in performance degradation as memory access has to traverse the interconnect. The problem with enabling Hot Add is that this is not directly visible when reviewing the virtual machines with ESXTOP. If the vCPU count exceeds the physical core count of a CPU package, a single VPD and PPD are created while spanning across two physical domains. 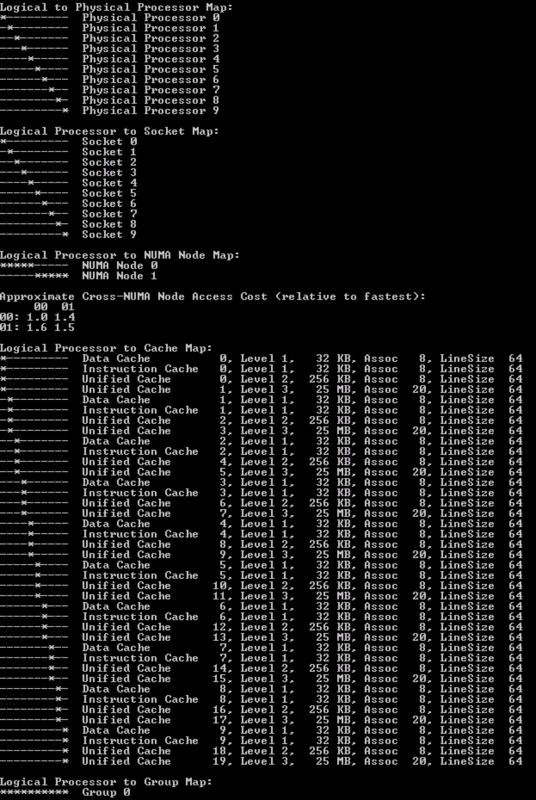 CoreInfo also shows that there are no NUMA nodes. However, ESXTOP shows something different.The two physical domains is the one that throws people off when reviewing the virtual machine in ESXTOP. As the virtual machine spans across two physical NUMA nodes, ESXTOP correctly reports it’s using the resources of NHN1 and NHN2. However, memory is spanned across the Nodes. The 100% locality is presented from a CPU perspective, i.e. whether the NUMA clients memory is on the same physical NUMA node its vCPUs are on.In this scenario, where memory is interleaved, you cannot determine whether the virtual machine is accessing local or remote memory. For most workloads, the best performance occurs when memory is accessed locally. The VM vCPU and memory configuration should reflect the workload requirements to extract the performance from the system. Typically VMs should be sized to fit in a single NUMA node. NUMA optimizations are a great help when VM configuration span multiple NUMA nodes, but if it can be avoided, aim for a single CPU package design. If a wide VM configuration is non-avoidable, I recommend researching the CPU consumption of the application. Often HTs provide enough performance to have VM still fit into a single CPU package and leverage 100% memory locality. This is achieved by setting the preferHT setting. If preferHT is used, align the cores per socket to the physical CPU package layout. This to leverage the operating system and application last level cache optimizations.